We all like to take vacations, and that includes priests who sometimes need to get away for awhile to re-energize – just like the rest of us. 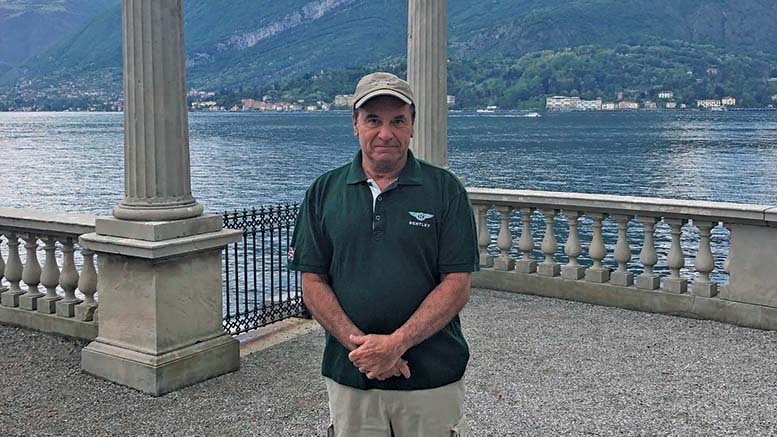 Father Jim has visited Italy often, but every time he goes he discovers something new. He last traveled to the “Old Country” in May. Where did you visit this time? The area of Lombardi in Northern Italy. I used a villa on Lake Como as home base. What did you do while you were there? I took day trips to Lugano in Switzerland, Venice and Milan. It’s different from Southern or Central Italy where most of our roots are. I actually enjoyed hiking, walking, reading – the restaurants and some amount of local wines. I enjoyed meeting tourists from all over. How long were you in the country? About two weeks, which goes by quickly. What were some of the highlights? The boat cruises on Lake Como with beautiful Italian and Swiss Alps circled all around with their peaks. How many times have you visited Italy? I’ve been in the “Old Country” many times. I used to lead tours with the Perillo Tour outfit. When was your first visit and what did you do? My first visit was with college friends some years ago. I did take a year to study Catholic liturgy at the ancient San Anselmo Benedictine School in Rome. What have been some of your favorite attractions? Of course, Rome and the Vatican. Also, the Amalfi coast and the town and area of my father’s birth in the Abruzzi region. If you were a tour guide, where would you advise people to visit? Everything in Italy is worth seeing —Florence for art and architecture, Rome and the Greek temples of Sicily for history, any town or city for the food and wine and music, any piazza for the people. My advice would be not to bite off more than you can chew, even for first-timers. Italy is large; get to know one area well. Visit another area another time. You also met Pope John Paul II years ago. How did that come about and what were your feelings at the time? While living and studying in Rome, my priest friend and I with small group of eight or 10 attended morning Mass in the pope’s private chapel, after meeting and mingling in pope’s library. I spent time with now-canonized St. John Paul II. What are your feelings now that you met an actual saint? Meeting a saint? I had been prepared by knowing my mother! Why do you go back on occasion? What is the draw? The draw is that not even in one lifetime can a person get their fill of Italy, especially for those who are 100 percent of Italian lineage. For those that never have traveled overseas, tell us about your flight, where you stopped and how long it takes? I flew from Boston to Munich (German) to Milan (Italy) on a German airline. Very well done. It’s about six hours if flights are on time. Have you ever visited the place or places from where your family originated? Family origins are in the mountains of Abruzzi about 45 miles from Rome, and the Naples area on mother’s side. In other words, brains and food. Do you plan to go back some day? I plan to go back, probably. You have to tour when you can walk … there’s lots of it. What kind of advice would you give to would-be travelers? Would-be travelers should plan well, not changing places too often. Enjoy, relax and build in time to do nothing. Is there one lesson you’ve learned about traveling to Italy? You really don’t need to speak the language. The young people speak better English than some people here, that I know. Another lesson, sometimes what isn’t planned can be as rewarding as the most well-planned excursions. Just take a random turn and discover places and people. St. Mary of Mount Carmel / Blessed Sacrament Parish 2019 | Newspaper Lite by Mirrorgrid Store.